Ms. Tipismana is the Alumni and Development Officer at TASIS and serves as the faculty leader for Intergenerations, which connects TASIS students with residents of Al Pagnolo, a local retirement home. Her own remarkable story was recently featured in both Migros Magazine and Cooperation, Coop’s weekly magazine. 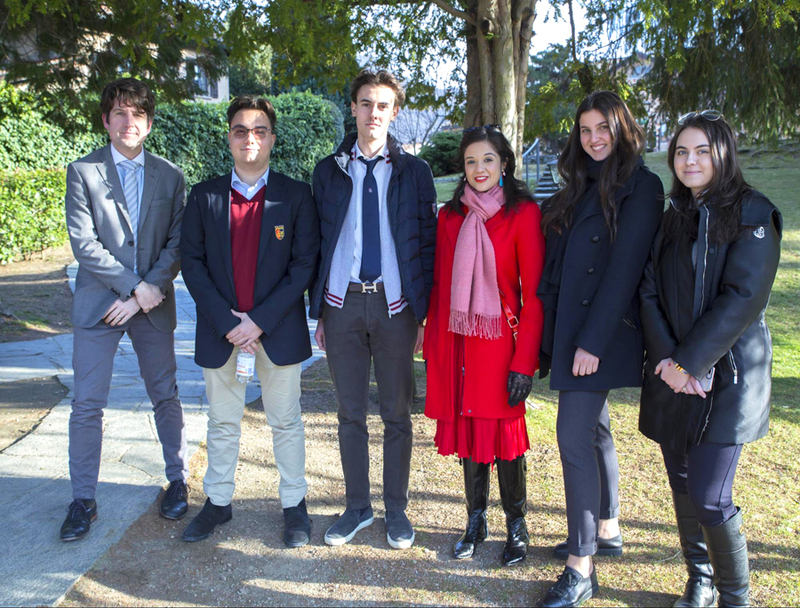 Ms. Roowalla, the Assistant Director of Admissions at TASIS, is the faculty leader for OTAF, a new Service Learning group that provides support for members of the local community struggling with differing degrees of physical and mental disabilities. She is also a professional artist working under the alias HERO. Can you please provide a brief description of what your Service Learning group does? ZT: My Service Learning group is called Intergenerations, and twice a month we visit a retirement home in Sorengo. We plan activities that we can do with the senior citizens, such as bingo, baking cookies, making decorations, and helping decorate the common room they have and maybe even their own rooms. We organize these activities with the sole purpose of creating a connection between the students and the residents because obviously there is a huge generation gap. Our goal is to have the students connect with them on a completely different level than anything they’re used to. HR: My Service Learning group is OTAF, which is the name of the organization that is based down the hill from us and has been around for about a hundred years. The association itself is for people of all ages with disabilities, and they have a variety of facilities. What our group specifically does is host three people with varying degrees of disabilities on the TASIS campus for activities twice a month. In general, we work on building awareness among students for people with disabilities. The same three people visit our campus each time, and the purpose of the visits is to foster a friendship—to build some really close relationships. This is the first year the OTAF group has been part of the TASIS Service Learning Program, and we only have five students. Because it’s the same students with the same guests each time, they form a very close connection. What should students expect when going to the retirement home or when meeting the guests with disabilities? What do you tell them to make them more at ease? ZT:I tell them they are definitely going to be putting themselves in a position where they are outside their comfort zone, but that’s exactly why we’re doing what we’re doing. I think, ultimately, service learning is about more than just serving—it’s also about getting outside your comfort zone on so many different levels and so many different layers. I tell them to expect the unexpected, expect to be uncomfortable, expect to be a little scared, and expect to be a little lost and confused sometimes—but that it’s all part of the experience. Once you get through all that you’ll appreciate it for what it is and for what it gives you. HR: I agree with what Zuleika said. Furthermore, the best advice I give is that a smile and a positive attitude can really go a long way. At the end of the day, you meet people who are very different from yourself, but then you end up finding so many commonalities that break down any barriers. What do the residents of Al Pagnolo or the guests from OTAF with disabilities get from these interactions? And what do the students learn? HR: The benefit to the students is that they are absolutely faced with a different reality from their own. That opens up their way of seeing the world and the people around them. The guests also get to see a place that’s different from their own, especially the OTAF residents who are very much used to their routine and seeing the same people and same environments. For them to just get out and come here to campus, it’s a great opportunity to see something different. ZT: I would say exactly the same thing. You’re exposed to a different reality than what you’re used to. I think that in general students tend to be in a very safe place. I know I was as a student. College was a huge reality check for me. It was an awakening because I was outside the comfort of my little walls. In a similar way, Intergenerations gives students an opportunity to step a little bit outside—to get an idea of what the outside world is and see that there are people out there who have different backgrounds, lifestyles, upbringings, and conditions. At the end of the day, we’re all human. We’re all the same—we just go through life in a different way. Our groups help students see that. What are some of the challenges your groups face? ZT: I would say the initial fear of not being quite sure of themselves and not being sure how they want to approach the visit or how they want to approach the residents can be quite scary the first couple of visits. The students are not quite sure what to make of it or how to interact and connect with the residents. Once they get past that and see that it’s actually really easy—as Helen said, you just have to make an effort, have the right attitude, make sure you’re smiling, and put your best foot forward—it becomes easier and they loosen up a bit. For me, that’s actually why I love doing what I do. I see the progress that the students make and how over time they get better and better and more confident in who they are. HR: I would say the only challenge I can think of is that we don’t really have a lot of time for the visits. They are only twice a month and last for about an hour if you consider transportation time and getting set up. We get the most out of it, but I wish we had a lot more time. Why is it essential for students to have these one-on-one interactions? HR: We talk about awareness at our morning meetings each week, and that is not without value. But at the end of the day, nothing beats a personal interaction with an individual. That’s just priceless. ZT: I agree. I think you can definitely learn something from someone when it’s one-on-one. When you make that extra effort, you see the benefits immediately. I have seen some of my students make really amazing connections with the residents at Al Pagnolo. They look forward to the visits, and the residents look forward to seeing them because of the connections they’ve made. That speaks volumes. HR: You also learn that the person is not their age or their disability. It’s their personality and the person that they are. That comes through the one-on-one interaction. ZT: You can’t put a price on experiences—your upbringing, your childhood, your first date, your first boyfriend, the first time you started driving. These are experiences we all go through at some point in our lives in different shapes or forms. These are the moments where you connect. You find that common ground. What are the requirements for your groups? HR: Being an Italian speaker or at least an Italian learner is essential because the first language of all the residents is Italian. But several of them have expressed an interest in learning English, so we’re basing some of our activities around that now. I guess the only true requirement is to have an open, positive attitude. ZT: Speaking Italian, but we’re also flexible. We manage. We work around it. We have some residents who also speak French and English. We have had students before who didn’t speak Italian fluently, so they struggled a little bit, but we worked around that. Why did the two of you become involved with your individual groups? ZT: For me, it’s kind of a personal thing because I know what it’s like to be in an institution. I had an accident 15 years ago, so I spent a lot of time in hospitals—about eight months total. I know what it’s like to be in a place where you need company or someone to come visit you and spend time with you. It made a huge difference in my life to have that—to have someone bring me something to eat or some flowers or just stay to chat and connect. I’m now in a place where I’ve moved on from that, and I’ve embraced my life. I’m in a place where I can give back and do the same for someone else. I can be a part of that somehow. HR: Before I joined the OTAF group this year, I used to be a coordinator for the 9th-grade Service Learning Program, which serves as a general introduction to service learning. After doing that for a year, I thought I’d like to gain the experience of being part of a local group. [Global Service Program Director] Mr. Mulert said the School was developing this new collaboration with OTAF and asked if I wanted to join. I said yes, of course, and here we are. Do you believe there is a stigma that goes along with your group? If so, how would you like to respond to it? ZT: I suppose there is a stigma in the sense that many people see the elderly as vulnerable and weak and think they don’t have much to contribute anymore. What can they talk about? In fact, I’ve had a few students ask questions like, “Well, do they know what this means? Would they know how to do this? Can they relate?” That’s just a preconception that some people might have, which isn’t the case obviously. They’re people. They’ve been through the same experiences that we have—in fact, they have more to share because of it. They have more to talk about. HR: The stigma is for the local groups in general—that they are not as glamorous as the global service groups. That’s absolutely not true. With a local group, you get to have visits throughout the year instead of working toward a trip of one or two weeks. From September, you’re already having these interactions and visits. I think that is more enriching. There are definitely people who need help in the local area as well. That’s what we’re here for. It fosters great relationships with our neighbors. It is very important for the School and the community. Do you have any personal stories of things you’ve seen with some of the people you’ve worked with? HR: One of our guests is a middle-aged man who’s blind, and he lost his sight a little later in life so it was a very difficult transition for him. He tends to be a very closed person and has difficulty interacting with people, but he has this passion of wanting to learn how to play the piano. When he started coming here to TASIS for the visits, he was very shy at first, but then he created this bond with one of our students that is absolutely great to watch. It’s just incredible. He looks for her, and he’s always asking for her if she isn’t there. We’ve exchanged voice messages between sessions to keep in touch. It’s been great to see him open up and also become more confident. That is just absolutely amazing to see. ZT: I have had a similar experience. I have a few boys who joined Intergenerations again this year. They said they joined it for the second time—some even for the third time—because they had befriended a lady named Carla. She’s the sweetest lady there. They adore her. They joined Intergenerations again just so they could spend more time with her and get to know her better Every time we go, they make it a point to sit next to her to have a chat and bring her something or show her pictures of their latest trips. They even wrote down a Dante poem because they know she loves Dante. They go out of their way whenever they can to show her that they appreciate her. This wouldn’t have happened if it weren’t for this group and for the Service Learning program. This for me is why I do what I do. You see it’s going somewhere and it actually works. There is a benefit.